How many brinks are in the Empire State building? How far away is Pluto? Make your best guess in this party game of estimating far-out facts. Draw a card and ask others for their best estimate to one of the 600 questions. 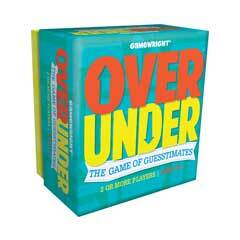 Then decide whether their answer is either OVER or UNDER the correct amount. Collect the most cards and guess what? You win!